What did ordinary people believe in post-Reformation England, and what did they do about it? This book looks at religious belief and practice through the eyes of five sorts of people: godly Protestant ministers, zealous Protestant laypeople, the ignorant, those who complained about the burdens of religion, and the Catholics. Based on 600 court and visitation books from three national and twelve local archives, it cites what people had to say about themselves, their religion, and the religions of others. How did people behave in church? What did they think of church rituals? What did they do on Sundays? What did they think of people of other faiths? How did they get along together, and what sort of issues produced tensions between them? What did parishioners think of their priests and what did the clergy think oftheir people? Was everyone seriously religious, or did some people mock or doubt religion? If these questions have been tackled before, it has usually been by way of claims about what the common people believed in books written by members of the educated ranks about their contemporaries. In contrast, by going directly to other sources of evidence such court records and parish complaints, this book illuminates what ordinary people actually said and did. 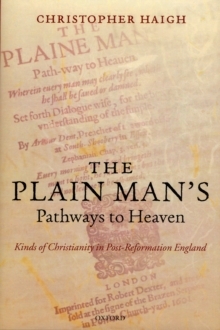 Written by one of our leading historians of early modern England, it is a lively and readable account of popular religion in Englandunder Elizabeth I and the early Stuarts, dealing with the results of the Reformation, reactions to official policy, and the background to the Civil Wars of the mid-17th century.